Aides-de-camp were first authorized by Congress on May 27, 1778 in a resolution specifying that each Major-General in the American Army would be allowed two “Aids-de-Camp” (each earning $24 per month). The first attempt to provide some sort of insignia or identifying uniform device for aides-de-camp came in 1780, when they were instructed to wear a green feather in their hats (George Washington’s aides wore green and white feathers). Feathers gave way to plumes and pompoms, but by 1872 the only uniform accouterment distinguishing aides from the officers they served were aiguillettes. In 1902, artist Howard Chandler Christy, who had earned famed with his paintings of battle scenes from the Spanish-American war, designed a collar insignia for aides featuring a gilt eagle atop a shield emblazoned with thirteen red and white stripes. A multitude of variations on this theme were created over the next several decades, with varying colors and number of stripes. But its most famous use came in 1946, when an insignia for Aides to the President of the United States was finally established. The insignia featured the gilt eagle and shield with thirteen stripes, but circling this familiar imagery was an annulet of 48 stars—the number of states at the time. 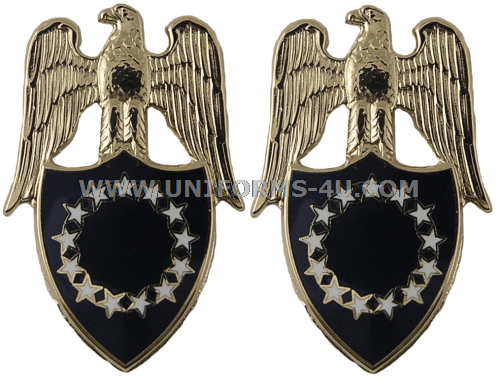 The insignia was later changed to its current design of 13 white on stars on a blue shield surmounted by a gilt eagle. One would be tempted to think the change was made to avoid the inconvenience of adding stars to the insignia to reflect the additions of Hawaii and Alaska as states, but in point of fact the change came in 1953, roughly six years before either state was admitted to the Union. 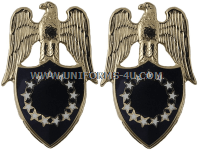 Military aides to the President are authorized to wear Service or Dress aiguillettes when performing their duties. As the name implies, the Service aiguillette is worn with the Army Service Uniform; it’s also authorized for wear with the black all-weather coat. Service aiguillettes are available in gold-colored rayon or synthetic gold and are worn with the four-in-hand tie. Also available in rayon or synthetic gold, Dress aiguillettes are primarily worn with Blue or White Mess Dress (and Evening Mess) uniforms; they’re worn with the blue dress uniform only when the wear of a bow tie is prescribed.